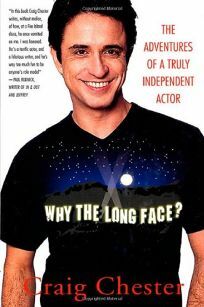 In this witty, absorbing memoir, Chester muses about his unlikely trajectory from growing up around trailer parks and born-again Christians to working as an openly gay actor who's appeared in several indie films, including Swoon, for which he earned a Spirit Award nomination. An engaging storyteller, Chester indiscriminately pokes fun at himself and others and is almost always upbeat (save for nicknaming his hellish summer camp ""Kidshwitz""). It's not all light, though. Chester tackles serious issues and candidly reveals his own struggles with his career, relationships, substance abuse and a disfiguring jaw malady (hence the title: ""By fourteen,"" he writes, ""I looked like a Picasso sock puppet with pimples"") that required extensive, painful surgeries. Although readers may wonder how real some of Chester's fiction-worthy characters are, they'll nonetheless be entertained. Chester has a fresh voice-though occasionally he tries too hard to be funny-and when he opines that ""the most counterproductive barriers to true genius are a healthy childhood, healthy relationships, and healthy surroundings,"" readers will be grateful he suffered no such encumbrances.